Loss of mobility is the leading reason people are removed from their home and transferred to a nursing facility. A person living at home who is living a somewhat normal life will need to transfer from 30 to 50 times a day depending if the transfers include to a car for beauty appointments, Dr.’s appointments or other desired outside locations. The nursing home eliminates the need to transfer so often keeping the person in place most of the time. 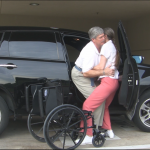 Resident care may be necessary for many but many could have remained home if their caregivers could deal with the mobility issue. But caregivers do not know how to accomplish this task without stress and strain that pose risk of injury to both parties. Using a simple technique like the balance pivot can reduce the transfer weight to a small percentage of the weight that would have to be handled. The result a balance pivot transfer is simple, safe and easy. Learn more about these transfers and the techniques that make them possible. www.nolifttransfer.com Move family members does not have to be a problem.